"Cartmell & Murton. 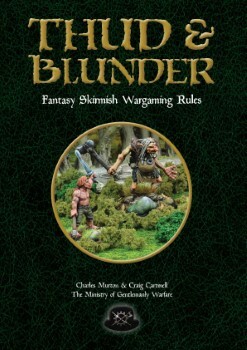 Thud & Blunder is a set of generic fantasy skirmish wargaming rules from the Ministry of Gentlemanly Warfare, whose authors have previously brought you In Her Majesty’s Name, Daisho and Blood Eagle. With just five to fifteen figures a side you can play a party of brave adventurers, a knight and his retinue, a college of powerful wizards, a company of dwarven prospectors."